Advice from an ASID interior designer can make all the difference. Whimsy Interiors, Ruffles and Trains Photography. 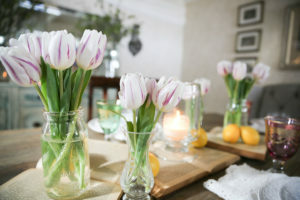 Spring has sprung and it’s time to update your home for the warmer seasons. 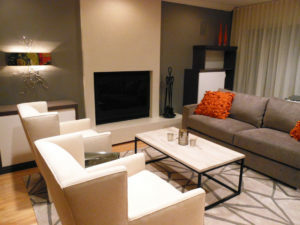 What finishes, furnishings, art and layout changes can do the trick without breaking the bank? The New Jersey Chapter of ASID (American Society of Interior Designers) has launched “Design Experience…Impacting Lives Through Professional Interior Design” to help you do just that and to learn what it’s like to work with a professional interior designer while you’re at it. Members of ASID have completed rigorous design training and are required to refresh that training every year; they are educated, creative professionals whose talent and skills can positively impact the design of your home or place of business. Hope Sferra, allied ASID, NJCID, of Hope Sferra Interiors in Summit, NJ, advises that expanding your space doesn’t always entail an addition; she says to look at the existing footprint and make use of every square inch. She recently expanded a cramped kitchen by removing a wall and carefully designing a high-functioning, clean-lined cabinet layout that goes up to the ceiling. Does your home need character? Kristina Favale, allied ASID, of Whimsy Interiors in Wayne, NJ, advises adding reclaimed wood to your walls, ceilings and fireplaces. “Bring in unique, one-of-a-kind pieces that make a statement and tell a story in your space. Old doors, carved sideboards and reclaimed wood mantels can work with all different styles and spaces; architectural pieces can also be used as artwork,” Favale says. Photo by Ruffles and Trains Photography. 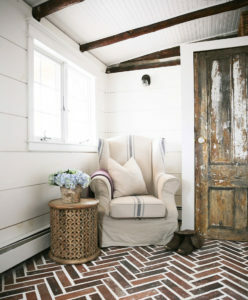 Kristina Favale, allied ASID, of Whimsy Interiors in Wayne, NJ, advises adding reclaimed wood for character, as she did in this room. Photo by Ruffles and Trains Photography Wallpaper is back, Favale says, and textures of wallpaper can be used in many different ways, as this Whimsy Interiors photo shows. 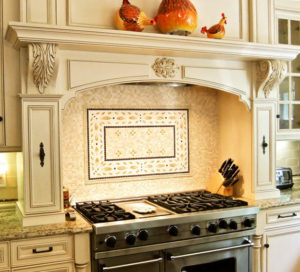 A well-designed kitchen backsplash will add to the resale value of your home. Rona Spiegel, ASID, CID, of Lifestyle Interior Designs in Englewood Cliffs, NJ, worked with the owners of a townhouse where the builder had left the backsplash bare. “Since resale was on their minds, we wanted it to be sophisticated and appealing to future buyers,” Spiegel says. “We decided to enhance and upgrade the focal point of the kitchen, the area behind the stovetop.” She combined several stone mosaics and other natural elements for a total design that conveys elegance. When the townhouse sold a few years later, the new homeowners said the kitchen backsplash was a key factor. “A well-designed backsplash can add to the resale value of your home,” notes Rona Spiegel, ASID, CID, of Lifestyle Interior designs in Englewood Cliffs, NJ. Her work is showcased above. Did you know that when hanging a piece of artwork, you should place the center of the piece at five feet from the floor for maximum appeal? Linda Barrett Wagner, ASID, CID, of Barrett Wagner Interior Design in Wall, NJ, says this is a general rule of thumb; she also advises reorganizing groupings by theme, color or frame style. Proper lighting is important too. “In rescuing this double-height foyer from the 1980s, I designed woodwork to be applied on three-quarters of the wall — in essence, it visually brought down the height of the space and gave it warmth,” says Terri Fiori, allied ASID, of Fiori Interior Design in Wyckoff, NJ. The addition of white paint, a darker stain on the wood floors as well as a runner completed the update. 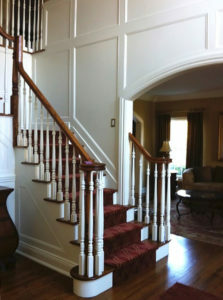 The addition of moldings can warm up a double-height foyer, as shown in this foyer designed by Terri Fiori, allied ASID, of Fiori Interior Design in Wyckoff, NJ. Don’t be afraid to give your fireplace a contemporary transformation. Pat Valentine Ziv, ASID, of PVZ Design in Mountainside, NJ, did it by going vertical and using an off-white custom concrete façade, black and glass fireplace doors, and a floating hearth. Pat Valentine Ziv, ASID, OF PVZ Design in Mountainside, NJ, shares that updating your fireplace can change the look of a room. Her recent work featured above is an excellent example. To learn firsthand how a professional interior designer can impact your life, sign up now at: nj.asid.org/design-experience-open to be matched to an ASID designer. New Jersey locations only. Questions? Contact info@nj.asid.org.